Scotch whisky records could tumble again this week when a bottle of 70 year-old Private Collection Glenlivet 1943 goes up for sale in Glasgow. Tomorrow (Friday 17 August) the rare collectors’ item will be sold at McTear’s auction in Glasgow with a pre-sale estimate of £30,000-£40,000. The whisky is from Sherry cask 121 that was filled with spirit on 14 January 1943 by Gordon and MacPhail’s senior partner, John Urquhart. It then matured for 70years before being bottled by Stephen Rankin, Urquhart’s great grandson and current director of Gordon & MacPhail, in 2013. Just 42 decanters were filled in the limited bottling. McTear’s whisky expert, Graeme Maxwell, commented: “The creation of this stunning single malt has been a true family affair, with generations of the Urquhart family ensuring that the finished product takes its rightful place as one of the finest single malt whiskies on the planet. 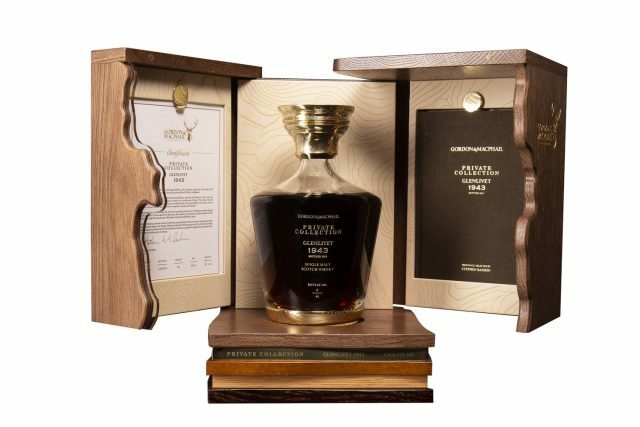 “We have seen some exceptional bottles come through the doors at McTear’s over the years and there is no doubt this sits as one of the most magnificent whiskies we have had the privilege to auction. It is very possible the whisky will far exceed its high estimate given the recent run of results for rare spirits at auction. On 6 August a 1967 bottling of Laphroaig from Silvano Samaroli sold for £61,000, smashing not only its high estimate but all known records for that particular whisky as well, while a 1966 Bowmore made £50,000 last month. I have a unopened bottle of Angus Scotch Whiskey with the white angus bull still on it it was purchased in December 1948, so it is 70yrs old would it be worth anything at auction.